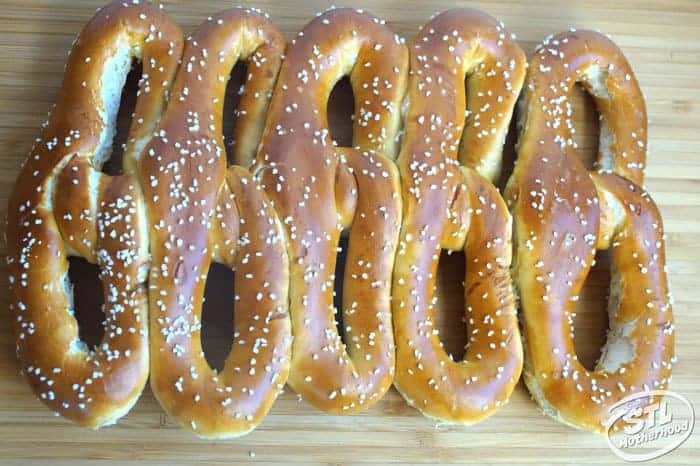 Need a pretzel fix fast, but not heading to the ballpark anytime soon? Now you can get your favorite stadium treat right in West County! 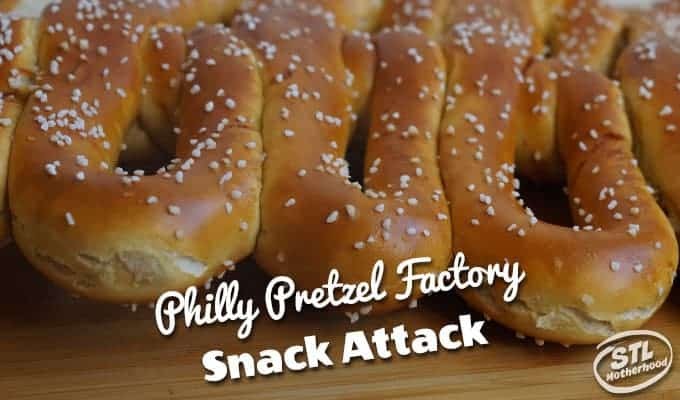 This post is sponsored by U.S. Family Guide and the Philly Pretzel Factory....all opinions are mine. I stopped at the Philly Pretzel Factory yesterday and scooped up the biggest bag of hot pretzel goodness you'd ever seen. The Factory is located at 14744 Manchester Road, in Ballwin--about as far from the places I normally find pretzels as you can image. I'm not gonna lie: I'm a pretzel junkie. Whenever we visit a stadium or beer garden I'm scouting out places for my next carbolicious pretzel fix. 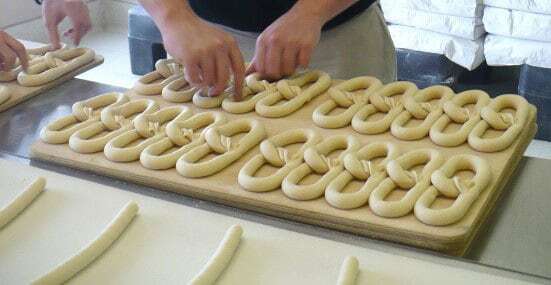 The guys at Philly Pretzel Factory were happy to tell me all about their pretzel kitchen. They make their dough on site--the recipe might be from Philadelphia, but everything is mixed and twisted and baked locally. Pretzels are baked through out the day so you are guaranteed a fresh treat whenever you walk in the door. In fact, the pretzels I ordered came right out of the oven and into a bag, just for me! 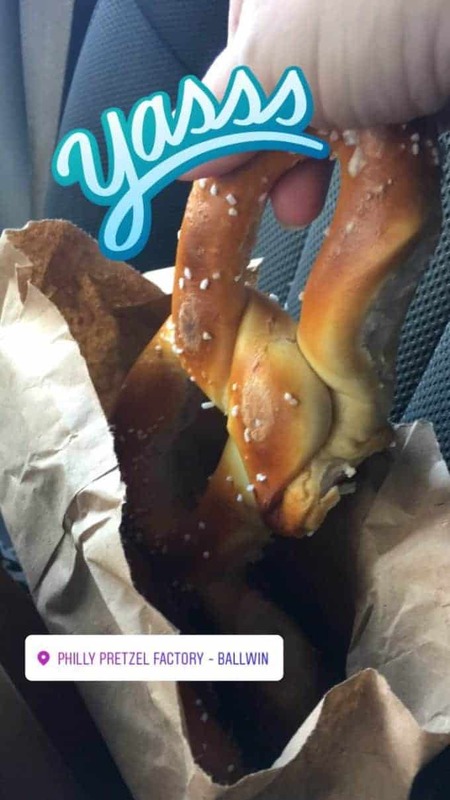 You can get more than just a standard pretzel at the Factory. Real Pretzels, the standard size, start at 3 for $3. They get cheaper in bulk, so next time you need a tailing snack or office treat, grab a box of 25 for $16! Then there's mini pretzels and Rivets, which are small pretzels and pretzel nuggets. The Rivets can be purchased by the cup--great for on the go snacking--or by the party tray. They also have Cinnamon Pretzel Twists, Pretzel Dogs, Pretzel Sausages, Pepperonis Pretzel Melts and, of course, a Cheesesteak Pretzel. That's a whole Philly cheesesteak sandwich stuffed INSIDE a pretzel. It's pretty dang good. They have tons of dips for your pretzels too! There's cream cheese, cheddar cheese and nacho cheese. The nacho cheese is the best--just like the ballpark, but maybe better. If you're into mustard they have yellow, spicy, hot and honey mustard. Oh, and if you're getting the cinnamon pretzel you have a choice of butter cream (yes, icing! ), chocolate and cinnamon. If you don't live close to Ballwin, you'll love to know that Philly Pretzel Factory pretzels are not only pretty dang cheap in bulk, they freeze beautifully. Just pop them in the toaster oven to freshen them up! But they're really best if you eat them on the spot, fresh out of the oven. 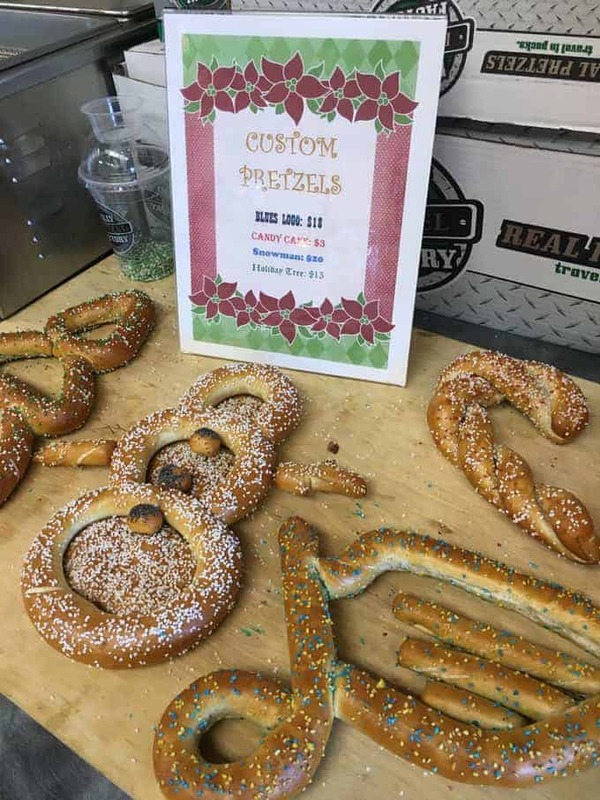 If you really want to impress people at your next party, you can order a custom pretzel! Right now they're offering candy cane, snowmen and Christmas tree shapes...as well as a super awesome Blue Note.